Ukrainian producer of hot and cold rolled coils. Manufacturer of high performance thin film materials providing metals, alloys, and ceramics for sputtering targets, evaporation sources, and other PVD materials in any defined configuration. Distributor of pigments, high purity metals, and chemicals. UMC specializes in metals for the MBE, bulk crystal growth, ion implantation industries, luminova, magnesium and other materials. Supplier of precious metals and their derivatives, with products ranging from metal blacks and sponges to organometallic compounds, for use in decorative materials, chemical catalysis and synthesis, electrical and electronic equipment, and other industrial applications. International organizer and trader in the area of steel, metals and the connected raw and scrap materials. Buy, sell and search for materials. deals in end of life vehicles, metals recovery and environmental protection. they work with electrical goods waste, cars, non-ferrous metals, demolition, and ferrous metals. A diversified metals distributor which specializes in small quantities and cut-to-length metals. Fully owned by Westbrook Metals, Inc. of Central and South Texas. Importers, processors, recyclers and traders of the entire range of base metals and minor metals and metal scrap. Fine metals of Au-Ag-Pt-Pd and investment bars, refining, and semifinished products. Special metals such as Platinum, Zirkonium, Boron, and Selen. Offer a complete line of expanded metals, perforated metals and expanded metal grating. Fabricating service center providing expanded metals, perforated metals, bar grating, fiberglass grating, wire cloth, and grip strut safety grating. Manufacturer and supplier of research chemicals, metals and materials. Laser engraving, marking and etching processes on metals, plastics, wood and other materials. Distributor of brass, bronze and copper materials . Site lists most shapes and sizes available. Consultant in the grinding & finishing of materials, including wood, metals, plastics, and ceramics. Manufactures quality roofing, decking, and wall cladding materials. Also installs. Engineering services firm meeting the needs of companies materials processing, and joining metals. Retailer/distributor of metals, trim, and other building materials and tools through fifteen retail locations. recycler of scrap metals, wood, and demolition materials on vancouver island, bc. based in victoria. scott metals - recycling all metals from aluminium to zinc. manufacturer of soldering materials for the electronic assembly industry. including solder pastes, fluxes, cleaners, solders and stencils. Full service distributor of aluminum materials for the commercial, aerospace, and sign industries. Sheet, plate , coil, extrusion. Presents CNC machining and tuning services focused on exotic metals and plastics. Provides a company overview, materials and equipment lists, and contact data. If the business hours of Zaporizhstal in may vary on holidays like Valentine’s Day, Washington’s Birthday, St. Patrick’s Day, Easter, Easter eve and Mother’s day. We display standard opening hours and price ranges in our profile site. We recommend to check out zaporizhstal.com/ for further information. 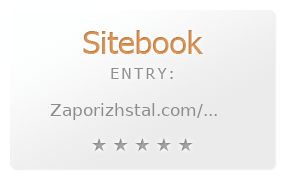 You can also search for Alternatives for zaporizhstal.com/ on our Review Site Sitebook.org All trademarks are the property of their respective owners. If we should delete this entry, please send us a short E-Mail.